The first step is to determine whether the newspaper is printed on wood pulp or rag linen paper. For the most part, newspapers printed PRIOR to the Custer Massacre in 1876, were printed on rag linen. This type of paper has NO ACID, thus there is no need to have it de-acidified (removal of the acid). Wood pulp paper, however, contains LOTS OF ACID. De-acidifying wood pulp paper is VERY COSTLY, so should only be done on high-value newspapers, or those with great sentimental value. 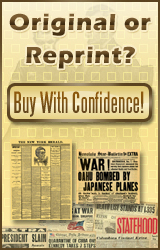 To have an archivist or conservator do the job might cost between $25 and $50 per page of the newspaper. This, for a typical 12-page 20h century newspaper, it would cost between $300 and $700 to have it done right. There is a special aerosol spray for the do-it-yourselfers, but even that method will still cost $10 per page or so to do the job. Thus, even utilizing this method, it will still cost $100 or more per newspaper to de-acidify it. Donít be overly concerned about the acid in wood pulp paper however. Next, keep all the newspapers away from sunlight and moisture. Direct sunlight on a wood pulp newspaper can turn it yellow in a matter of weeks. Exposure to moisture will cause mold to grow on the newspaper and greatly affect collector value. Although there are special acid-free boxes for storage of newspapers, there is a less-costly method to utilize. First, purchase a bundle of acid-free tissue paper and wrap each newspaper individually. Seal it in a few spots with archival tape. (Do not put the tape on all edges and totally seal it. Leave areas where air CAN get in and out.) Then a flat "ordinary" box can be used for storage. A good rule of thumb is that a box no deeper than 10 inches works best. An alternate ideal storage box is the kind printersí film and paper comes in. Although these boxes are only about three-quarters of an inch deep, these work fine for storage of one or two 20th century newspapers. To find these boxes, check your Yellow Pages under "Printers". Skip the quick printers such as Kinkos, Print-in-a-Minute, etc. Instead, find commercial printers. Start telephoning them. The first question to ask if they can print with 17 by 22-inch metal plates. If the answer is "No", move on to the next printer on the list. Once you find one that does print on metal plates this size, ask them if they have any EMPTY ONES. A large commercial printer will go through 2 or 3 boxes a week. Most will gladly give you the boxes at no charge or a minimal fee -- $1 or so each. Why are these boxes ideal? They have a special lining in them to keep light and moisture out -- the two main enemies of newspaper preservation! Lastly, store the boxes of newspapers in a dry, heated area -- NOT an unheated garage, basement, attic, outdoor storage shed, etc. Iíve found the best place to store them is under a bed.